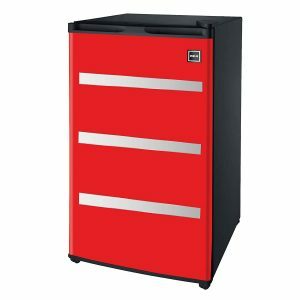 Igloo RFR329-Red is a sleek and modern, 3.2 cubic feet capacity tool box fridge to keep your beverages and snacks cool in your work area, garage, man cave or in your kitchen. Being designed as a freestanding tool box fridge it will blend nicely with your tools in your work area. It is one of the best selling new release mini fridges on Amazon.com with a few positive and negative reviews by 113 customers. It is easy to move around in your house on its four solid caster wheels. This also gives you a great deal of flexibility and you can lock down the wheels when you find the right spot for your fridge. This Tool Box Igloo Fridge weighs 48 pounds and measures 18 x 20 x 32 inches. It is easy on the eyes with its unique work tool box design for stand alone use. The door hinges on the steel door are reversible and you can choose to open it from the right or the left. The 3.2 cubic feet storage capacity gives you plenty of space for your beer, soda, water bottles and cans as well as snacks, for you to have easy access in your work area. The Igloo box reveals what’s inside, with a photo. 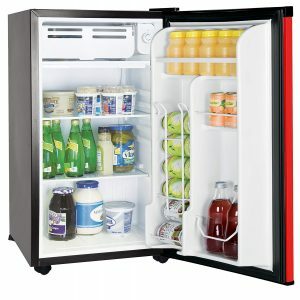 It has an efficient and powerful compressor to help keep your items cold while not using up much energy. You’ll find two removable wire shelves, a drip tray, a door can dispenser and a crisper. The crisper at the bottom will help keep your fruits and veggies fresh longer. It includes an adjustable thermostat inside and you can also use a thermometer to make sure you get down to the temperature you want- for a more accurate temp control. You can fit in about a 24 pack of bottles in its 3.2 cu ft space. There is not a lot of space inside, if you’re thinking of putting a keg. The two shelves can be adjusted to different slots or removed completely if you wish to put your wine bottles in. There is also a small freezer that works just fine for ice. The door has the flat silver strips that make them look like tool box handles. Some customers commented on dents because of shipping and that’s why the lower average score this fridge has. Otherwise it works well and keeps the drinks very cold, looks nice and modern and fits well with other tool boxes in a work area with its unique tool box design, is easy to move around, runs quietly, is efficient and economical to run and the price seems right. The red Igloo RFR329 would make a great gift for your dad or husband or any man that likes to work with tools. It offers rather good value for money.